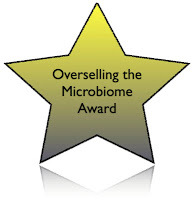 Update added 11/2/14 – for all my posts on Overselling the Microbiome go here. Well, I think today’s lesson is, many people, including many scientists and science reporters, just do not get that there is a difference between correlation and causation. I know – this is like beating a dead horse since many write about this issue. But it just needs to be called out every time until it stops. And today’s fun comes from stories and the original research articles about how exercise supposedly alters the gut microbiome. They selected subjects – 40 “elite” rugby players. They identified healthy male “controls” with similar age and size and from similar place. Then they collected faecal and blood samples from participants and did surveys about their nutrition and clinical data. Then they did some bioinformatics and found differences between the rugby players and the controls in many features including microbiomes. For which they have no support. They do not in any way show that exercise has ANY affect on the microbiota. They show it is correlated to the microbiota. The article is the first report that exercise increases gut microbiota richness/diversity and highlights that exercise is another important factor in the complex relationship among the host, host immunity and the microbiota. No. They did not show exercise increased gut microbiota diversity. How can the difference between correlation and causation be missed in these articles? Are these not even reviewed? Sure – this is consistent with exercise affecting microbiomes but it is also consistent with rugby players having different diets and other behaviors. There is a big difference between showing cause and effect and showing correlation. 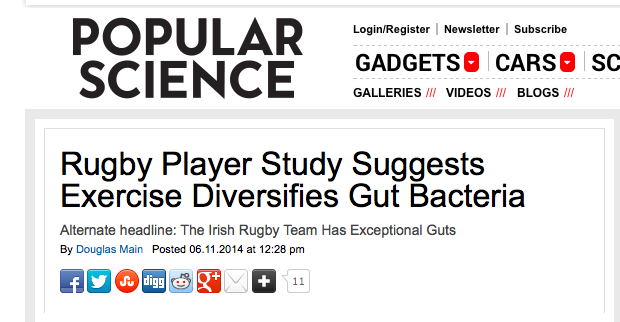 For not distinguishing between correlation and causation regarding the rugby player microbiomes I am giving all involved here an “Overselling the Microbiome Award“. Here is a microbiome theory I will leave you with. I hypothesize that these papers, and all the other ones that oversell the microbiome, themselves cause major changes in the microbiome of many people. Evidence for this? Well, none yet. But I have a correlation. The correlation is, after reading these papers, I feel sick to my stomach. That must be proof right?
. @Sandlot1313 @davidkroll @KristinaMFiore @medpagetoday exactly – whole effect could be diet, other behaviors, social contacts, travel, etc. The press release from Gut associated with this paper contains many inaccurate statements. Text: Exercise boosts the diversity of the bacteria found in the gut, indicates the first study of its kind published online in the journal Gut. Somewhat surprised that such mistakes would come from the journal itself. Kritina Fiore has fixed the Medpage article. Nice. Science Magazine gets the causation vs. correlation issue wrong in their little news piece about this. Yuck. Keeping track of some of the Tweets about this on Storfy. Oh FFS. Now I have found some articles reporting not only that exercise affects gut microbial diversity but that this is why exercise reduces obesity. 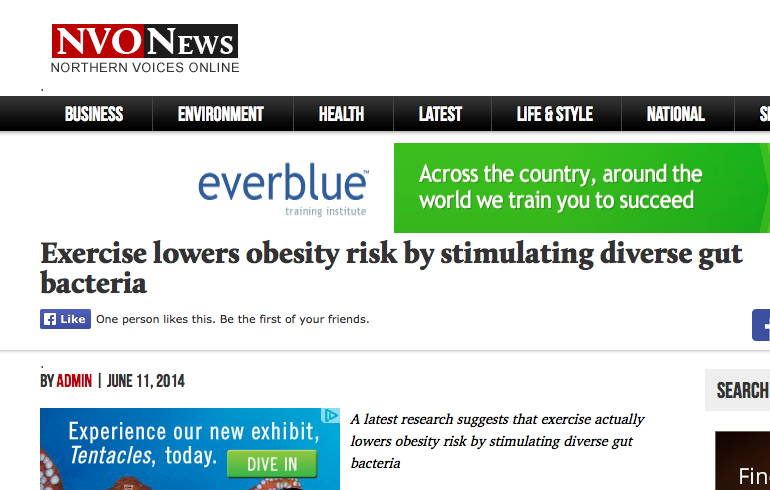 See Exercise lowers obesity risk by stimulating diverse gut bacteria in the NVO News, for example. Fox News did better with the science (at least in their headline) than many other News Agencies (and much better than NPR). They report “Exercise may lead to healthier gut bacteria“. Just that word “May” makes me happy. I know. Low bar. But I will take what I can get. Genome Web also is reporting on the story and on the “overselling” that was done. The findings suggest that, in addition to its other health benefits, frequent exercise may influence our weight and overall health by altering the kinds of organisms that live inside of us. Jonathan, thank you for correcting my interpretation of the overinterpretation. I'm usually pretty vigilant about not mistaking correlation for causation, as well as normally looking for confounding variables. I didn't have a chance to read the original paper before I tweeted Kristina's article. Points well-taken. no problem … I was a bit surprised to see your Tweet – which is why I responded .. There is your problem: those clowns will accept anything. Seriously, I have never – no, not ever – been pointed to a “journal” in the BMJ stable and found it to be worth anything – no, not anything. These is why reputable journals have peer review with teeth, because we have centuries of experience with overly ambitious people overly hyping their work. I don't think they need peer review with teeth to screen out some of this hype. They need peer review with gums. This claim is so obviously wrong no teeth required to catch it. Critically, I've in no way — absolutely no, never — already been directed to some “journal” within the BMJ steady as well as discovered this to become really worth something — absolutely no, nothing.